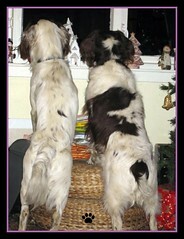 This is a picture of our springer spaniels last night, they heard something outside the house and headed straight to the window for a good old nose…. Arghhhhhh its December alrready !!!!!!!!!!! My poor blog is being neglected big time…. and a combination of things are causing my absence. Work is manic at the moment, so much to do and so little time to do it in. My sister flew in from Majorca yesterday for the week, so I’ll be spending loads of time with her. My laptop is giving me a huge headache, it keeps on switching itself off, so its very unreliable and extremely annoying to say the least.. its only a year old! So this evening I will give the number on the box a phone because it came with a 3 year warranty. Orders for cards have rocketed in the last fortnight so most of my spare time gets taken up with fulfilling orders… christmas cards especially I have a backlog of about 20 there already. Luckily I can access my blog from work, so tend to check in at lunchtimes.